HST WFC3 FR716N image of the “Teacup” containing the Hα+[NII] lines. Credit: Martin et al., 2017. (Phys.org)—A group of astronomers has discovered a giant nebula of ionized gas extending over 300,000 light years. This nebula turns out to be associated with the quasar dubbed the "Teacup." The finding was presented November 7 in a paper published online on the arXiv pre-print server. "Teacup" (official designation SDSS J143029.88+133912.0) is a radio-quiet type 2 quasar at a redshift of 0.085. It owes its nickname to the peculiar morphology of its extended ionized gas. Previous studies have reported that the quasar showcases a loop-shaped emission line structure resembling a "handle" that extends up to about 40,000 light years of the active galactic nucleus (AGN). More recently, a team of astronomers led by Montserrat Villar Martin of the Center of Astrobiology in Madrid, Spain, have conducted spectroscopic study of "Teacup" using the Optical System for Imaging and low Resolution Integrated Spectroscopy (OSIRIS) at the 10.4-m Great Canary Telescope (GTC) on the island of La Palma, in the Canaries, Spain. The observations carried out in February 2017 allowed the researchers to detect a giant ionized gas nebula, which appears to be associated with the studied quasar. "We present here new results based on optical long slit spectroscopic data obtained with the Spanish Gran Telescopio Canarias (GTC). We analyze and interpret the properties (size, kinematics, line ratios) of a newly discovered giant reservoir of ionized gas associated with the "Teacup," which extends for more than 100 kpc," the authors wrote in the paper. 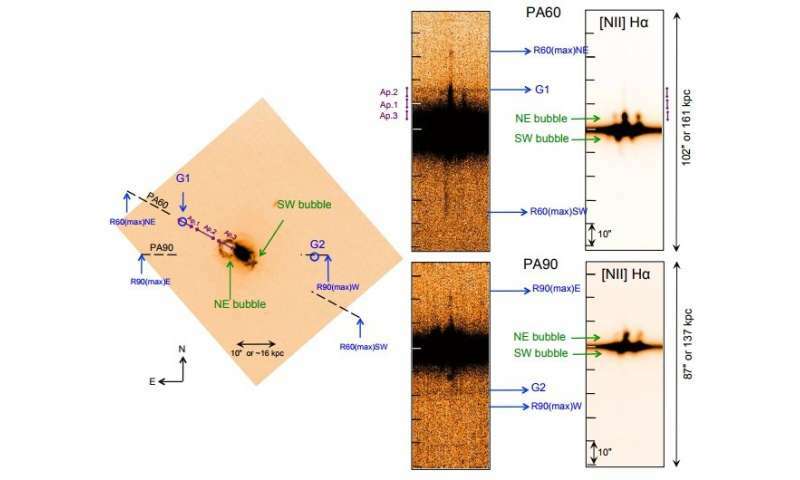 According to the study, the newly found ionized gas nebula extends about 360,000 light years across an emission line galaxy designated G1 (PA60) at a redshift of 0.317 and at least 230,000 light years across other galaxy named G2 (PA90) at a redshift of 0.57. Such dimensions make it one of the largest known ionized nebulae associated with active galaxies at any redshift. The researchers suggest that this nebula is part of the circumgalactic medium (CGM) of the "Teacup" quasar, which has been populated with tidal debris by galactic interactions. They assume that the nebula could be photoionized by the quasar's active galactic nucleus. "This rich, gaseous medium has been rendered visible due to the illumination by the powerful active nucleus, (…) The nebula is most likely photoionized by the AGN," the paper reads. The astronomers also found that kinematics of the nebula are much more quiescent in its outer parts and that the AGN of "Teacup" was more luminous in the past. They estimate that the dimming of the active galactic nucleus began some 46,000 years ago and since than it has faded by a factor of 115. The authors of the study emphasized that their discovery could be important for improving our understanding of circumgalactic medium. Given that large scale inflow and outflow from galaxies takes place in CGM, any new detections in this field could provide more insights into this processes believed to be shaping galaxies and driving their evolution. Therefore, they endorse astronomers to perform more detailed studies of active galactic nuclei. "Deep wide field integral field spectroscopy of powerful AGN with instruments such as MUSE on Very Large Telescope (VLT) opens up a way to detect and study the elusive material from the CGM around massive active galaxies thanks to the presence of a luminous AGN that can render it visible," the team concluded. We report the discovery of a ~100 kpc ionized nebula associated with the radio quiet type 2 quasar (QSO2) nicknamed the "Teacup" (z=0.085). The giant nebula is among the largest known around active galaxies at any z. We propose that it is part of the circumgalactic medium (CGM) of the QSO2 host, which has been populated with tidal debris by galactic interactions. This rich gaseous medium has been rendered visible due to the illumination by the powerful active nucleus (AGN). Subsolar abundances (~0.5Z(sun)) are tentatively favored by AGN photoionization models. We also report the detection of coronal emission (Fe+6) from the NE bubble, at ~9 kpc from the AGN. The detection of coronal lines at such large distances from the AGN and the [NII]/Halpha, [SII]/Halpha, [OI]/Halpha optical emission line ratios of the giant nebula are consistent with the fading quasar scenario proposed by Gagne et al. (2014). The fading rate appears to have been faster in the last ~46,000 yr. Deep wide field integral field spectroscopy of giant nebulae around powerful AGN such as the "Teacup's" with instruments such as MUSE on VLT opens up a way to detect and study the elusive material from the CGM around massive active galaxies thanks to the illumination by the luminous AGN. Arp's guesses are soundly refuted by every piece of observational evidence acquired since he made them. This has been pointed out to you innumerable times. Your continued repetition of these falsehoods serves only to make you look silly. What an oddly stupid thing to say, considering that Arp was a member of the IAU, published dozens of papers in respected journals, and whose names from his "Atlas of Peculiar Galaxies" are still used by professional astronomers to this day. , Arp's published papers, and the papers published in rebuttal (or in support) are how science tracks debates. Papers in Arp's favor are being published after his recent death. http://iopscience...ulltext/ So your statement was a lie. It's called gatekeeping, and Chandrasekhar, and most if not all of his papers, would have been shown to be irrelevant and meaningless. Someone of his stature would have to have extraordinary character to commit career suicide, clearly he didn't display the character befitting a scientist. Rather he behaved as a politician and the space sciences has been a political effort of the Dark Party ever since. Cited by 6, in almost 6-years. Doesn't look like too many folks see this as much of an issue. Only from a historical perspective will the delusion of the Dark Party be revealed. I have a feeling there will be flat-Earth type jokes directed at the GR, BB, Dark whatever types sooner than most think.